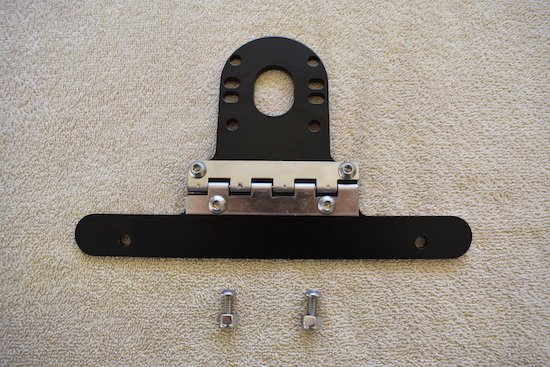 Boat trailer license plate bracket hinged. 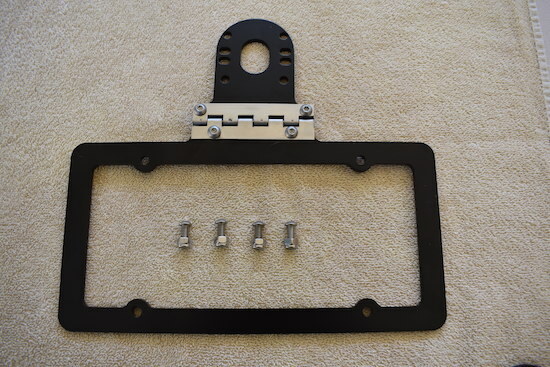 Car trailer license plate bracket hinged. 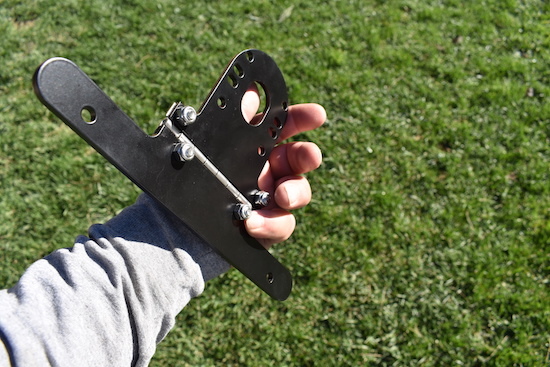 Utility trailer license plate bracket hinged. DUE TO MATERIAL PRICE INCREASES OUR PRICES HAVE CHANGED. 2 heavy duty models. Full frame and top bar. Also great for car hauler and utility trailers. 3/16" thick 5052 marine grade aluminum with 304 stainless steel piano hinge. 18-8 SS 1/4-20 button socket head screws with 18-8 nylock nuts. Swings 92 degrees forward and backwards. 184 degrees full travel. Quit spending time and money at the DMV! 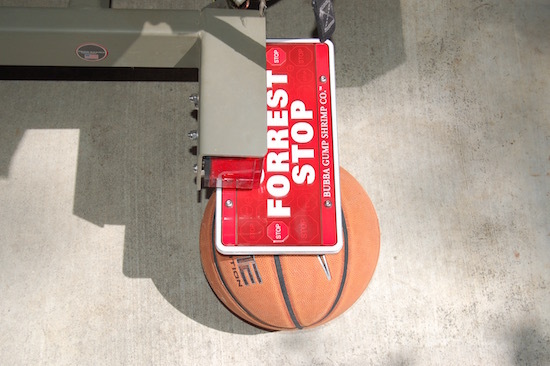 $3.00 to $5.00 licenses plate brackets will cost you more than $55.00. 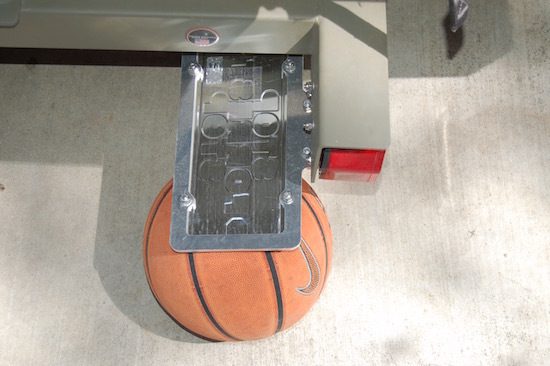 This license plate bracket will save you from more problems than it cost. Travel with confidence. This is the first one installed on my TRACKER Grizzly trailer. I was happy as goat in a sesame field. I dump my boat off dirt launches with no fear. I blast down dirt backwater roads littered with pucker bushes with absolute confidence that my plate will be there when I drive home. I can hit curbs and steep driveways knowing my plate will not get torn off my trailer or bent out of shape and soon to fall off. 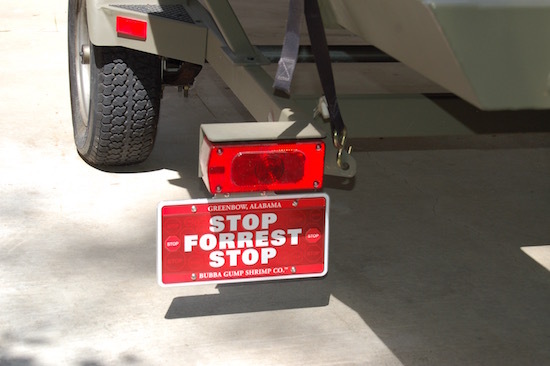 This is your best investment for your trailer. Theft resistant! 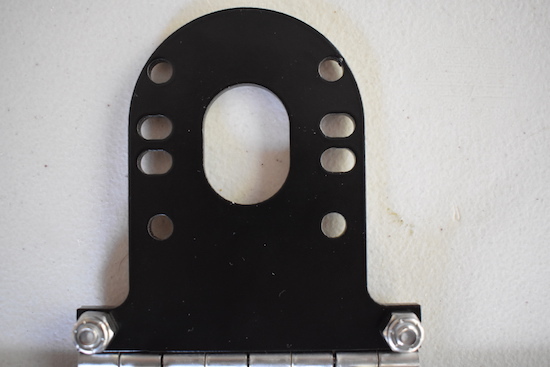 Trailer tail light stud slots fit 2" to 2" 1/4" spread for 1/4" studs. 4 hole pattern 2" x 2" for 1/4" inch bolt ridged mount. Laser cut from 3/16" thick marine grade 5052 aluminum. POWDER COATED BLACK 18-8 stainless hardware and 304 stainless hinge. comes with plate mount hardware. Price $44.99 USD plus USPS medium flat rate shipping in the USA. SALES TAX TO CALIFORNIA DESTINATION. 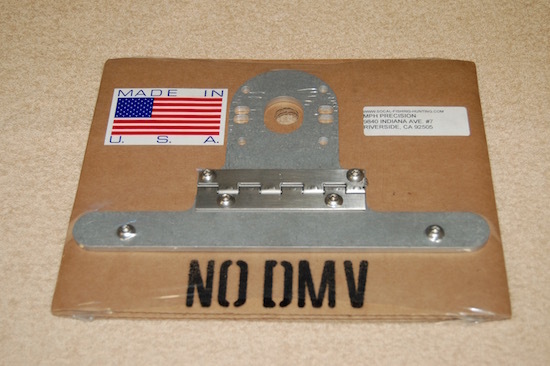 Trailer License Plate Mount, Top Mount: No paint. Laser cut from 3/16" thick marine grade 5052 aluminum. 18-8 stainless hardware and 304 stainless hinge. Comes with plate mounting hardware. Price $19.99 plus USPS medium flat rate shipping in the USA. SALES TAX TO CALIFORNIA DESTINATIONS. Laser cut from 3/16" thick marine grade 5052 aluminum. POWDER COATED BLACK. 18-8 stainless hardware and 304 stainless hinge. Comes with plate mounting hardware. Price $29.99 plus USPS medium flat rate shipping in the USA. SALES TAX TO CALIFORNIA DESTINATIONS.